The museum chronicles the experience of local soldiers in World War I and World War II. The Audie Murphy/American Cotton Museum in Greenville could just as easily be called the Hunt County Historical Museum. But why not lead with your best stuff? The Audie Murphy/American Cotton Museum, at 600 I-30 in Greenville, opens Tue-Sat, 10-5. Guided tours are available to groups of 10 or more by appointment. Call 903/450-4502. Murphy, the war hero turned actor, and cotton both grew from Hunt County’s rich black soil. Both went on to change the world. In their own ways, both were kings. Murphy won the most combat decorations of any American soldier in World War II, while a cotton compress in Greenville set world records for cotton production twice in the early 20th Century. Executive Director Susan Lanning says the museum was originally devoted to cotton and its role in local history. The Audie Murphy section was added in 2000 when the museum acquired a display from the local library, and the Murphy family contributed more to round out the exhibit. A 1906 Cadillac Model K and a re-creation of a 1920s main street illustrate life in a Texas cotton town in the early 20th Century. Visitors can window-shop five storefronts, including a drug store, beauty salon, and clothing store. The displays even include period prices, such as a Coca-Cola for five cents, purses for a dollar, and a gas range for $59.95. Nearby, the museum chronicles notable Hunt County residents from the era, including Gussie Nell Davis. Davis was born in Farmers-ville in 1906 and went on to found the Kilgore College Rangerettes, a group that revolutionized football half-time entertainment. In the museum’s cotton exhibit, visitors can feel raw cotton’s soft fibers clumped around small, hard seeds. Hunt County’s Blackland Prairie soil and climate were well-suited to the crop. With the arrival of the railroad in the late 19th Century, growers built gins in the county seat of Greenville, and the town became known as the cotton capital of Texas. Sharecroppers did much of the farming, and the museum’s replica sharecropper cabin depicts their hardscrabble living conditions with its newspaper-insulated walls and coal-burning stove. A large photograph from the early 1900s shows the local cotton compress with bales stacked as far as the eye can see, waiting to be loaded onto trains. The four-story compress stopped operating in 1991, but its 23-foot-long engine enjoys an afterlife at the museum. The cotton exhibit also highlights the various uses of cottonseed and cottonseed oil, from crackers and ice cream to toothpaste and cosmetics. Like the cotton plant, Audie Murphy found success as many things—soldier, actor, poet, and songwriter. Large framed paintings of Murphy flank the entrance to a small theater where a short film tells the story of his life. Born to poor sharecroppers near Kingston in 1925, Murphy had to grow up fast when his father abandoned the family. With only a fifth-grade education, he picked cotton and did other laborious jobs; hunting helped keep food on the table. In 1941, Murphy’s mother passed away when he was only 16. Later that year, Japan attacked Pearl Harbor and drew the United States into World War II. Murphy was anxious to enlist, but he was initially turned down because of his young age and small size. Exaggerating his age by one year, he managed to enlist in the Army in 1942—all five-foot-five inches and 112 pounds of him. He proved an unusually brave and skilled soldier, fighting in North Africa and across Europe, rising in the ranks and winning 33 combat decorations, including the Medal of Honor. The museum’s biopic chronicles the bravery that won Murphy’s Medal of Honor decoration. On January 26, 1945, in the Vosges Mountains of France, German tanks and infantry attacked Murphy’s company. Knowing they were outnumbered, he ordered his men to fall back into the woods for cover. Murphy stayed in the open to direct artillery fire by field radio. Then he climbed onto a crippled, burning American tank to fire its machine gun at the advancing troops. He stayed there an hour, shooting dozens of German infantrymen, some within 10 yards of the tank. With a leg wound and out of ammunition, he fell back into the woods, rallied his company, and counterattacked. The Germans withdrew. Outside of the theater, numerous exhibits honor Murphy as well as other local veterans. Visitors can walk through a re-creation of a World War I trench as the sounds of battle explode around them. 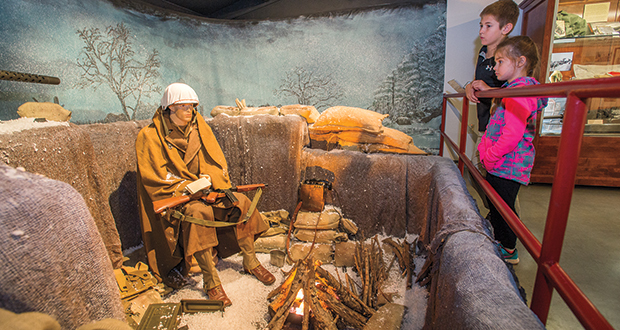 Side-by-side dioramas tell the moving story of a typical World War II soldier on the front lines and his wife back home. At the touch of a button, each reads aloud a letter from the other. Murphy returned home famous for his combat exploits. That led to a successful career in Hollywood as an actor, including playing himself in the 1955 blockbuster To Hell and Back. But he was also haunted by periods of depression and what today would be called post-traumatic stress disorder. He used his fame to call for more resources to help soldiers dealing with such issues. In 1971, Murphy died when a small plane he was riding in crashed during a storm in the mountains of Virginia. He was 45 years old. The museum ends where it begins, at a well-stocked gift shop. But there’s still more to see. On the 10-acre grounds outside, a larger-than-life statue of Murphy stands vigilant, and two historic structures—an 1852 settlers’ cabin and Greenville’s oldest standing house, built in 1859—welcome visitors. Like the exhibits inside the museum, they present an exciting, wide-ranging story—the history of Hunt County.